Home Starting new life at 60! Starting new life at 60! When Mr. Fernando’s two sons decided to settle down abroad, they invited their parents to come and live with them. But Mr. and Mrs. Fernando had other plans. They moved into a comfortable retirement home away from the city.”I wanted to live my retirement phase on my own terms and I have no qualms about it. My wife and I love to read and write, we enjoy nature and love to mix with like-minded people,” he said. Mr. Fernando and his wife are a part of the growing number of elderly people who are breaking away from the traditional family system and staying away from their children, mostly out of choice. Several factors are driving the demand for retirement housing in Sri Lanka. Our so-called demographic dividend will soon turn grey. Right now, nearly 2.6 million people (or roughly 12.5% of the population) are above 60 years of age. This number is expected to soar to 3.6 million by 2021 with 17 per cent of our population. 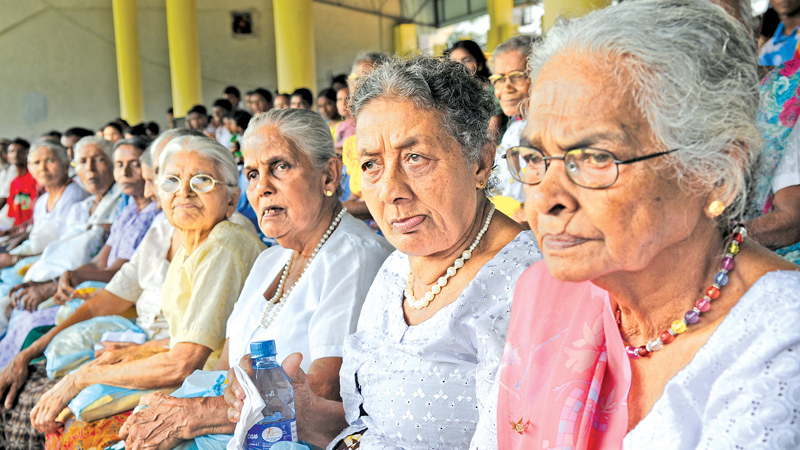 By 2041, one in every four Sri Lankan is expected to be elderly. The Government must understand the reality of the situation and get ready for the consequences. The large corporate groups must make use of this opportunity and foray into retirement villages, retirement homes and seniors-only homes. There was a time when senior care in Sri Lanka was confined to Homes for the aged. But those were generally meant for the destitute and run for charity. Things started to change at the turn of the century, with the mass exodus of young educated professionals to the West. Many sets of parents from the middle-class and upper middle-class groups found themselves in standalone mode. As a result, the largely ignored concept of retirement housing has been slowly witnessing an increased consumer interest across Sri Lanka. Since a large number of senior citizens being financially stronger than their earlier generations, the concept of comfort and luxury can be adopted within various retirement home projects. Since Sri Lanka has diverse financial demographics there are a number of options for senior citizens opting to stay in retirement homes. Some of the types of independent senior living homes are discussed below. Retirement villages – This concept offers cluster housing groups offering elderly people similar lifestyle outside of their homes, besides also taking care of day-to-day household services and medical emergencies. It also provides seniors with an option to spend the rest of their lives with like-minded people from the same age-group and income-group. The aim is also to provide active lifestyle to the seniors besides it gives them the freedom and independence to lead their day their way. In other countries where this concept is adapted, the developers are being sensitive and taking care of the needs of senior citizens while designing. They are maintained with a focus on special requirements of senior citizens – grab rails, anti-skid tiles, wheelchair-friendly premises, social and spiritual events, restaurants, convenience stores, libraries and a club area with rooms to play cards and follow hobbies. Besides, there are regular activities like cinema, cultural events and festivals to keep the occupants busy and active. Assisted Living Houses: With advancement of age, senior citizens require constant medical attention and aid. Assisted living houses are a concept which allows elderly to live with an assistant – either a family member or a medical nurse or helper. Such assisted living houses are comparatively a newer thought. However, this concept is developing in India and is likely to pick up here in the near future. The advantage of having a medical assistance cuts out any travelling time to hospitals making such homes quite useful for people with medical issues and other disabilities. Nursing homes for Seniors: These are skilled nursing care centres usually built at a close proximity to hospitals. Such homes have an in house medical team checking and monitoring the health issues of the inmates. Since an elderly person is quite prone to infections prevalent in a public hospital, these homes act like a private nursing care centre providing medical help in the comfort of a home. Seniors-only housing – These are for people aged above 55. In many Asian countries, this model is growing fast. Seniors-only housing is usually developed in the suburbs to keep costs down. Although it is part of a big township, entry is restricted to the residents. Cleaning, mopping and housekeeping of the homes, besides maintenance of the common areas and health clinic are covered in the monthly charges. Although all senior housing units come with kitchens, the managements also run canteens. Day Care Centres for Seniors - This is also an interesting concept. While a senior’s family members are out for work, he can move into a day centre to keep himself occupied and busy. The members of the family can breathe a sigh of relief, while their elderly loved one is being looked after by a professional team and is being offered a chance to get out of the home, socialize and participate in fun activities. The service is to extend social support system to the senior citizens in any sense. The concept of high end or luxury retirement villages has caught on fast globally with a larger percentage of the population over 60. In 2014, the first High-end Retirement Village in Sri Lanka was launched in five-star style, in line with the comfortable life style assured for its occupants. It is a 30-acre coconut plantation turned into a country-club styled project with 140 well appointed two bedroomed villas, set in idyllic surroundings. Many Lankan professionals are coming back to retire in the home country. Then there are the Lankan expatriates who desire to provide a life of comfort for their parents on their retirement. This could also interest retired foreigners opting for a safe and comfortable second home in Sri Lanka specially to spend their winter months. At the same time, now is the opportune moment for the Minister of Social Empowerment and Welfare to take deep look at the mission, objectives and related activities of the National Secretariat for Elders. The question to be asked is: Has the Secretariat grasped control of the whole concept of elder care, in all its forms, and to regulate those who provide it virtually in all settings and circumstances? According to the records, a little over 300 elders’ homes are in the country, including both state-run and private. The number of elders are supposed to be around 10,000. The Government itself knows that these figures are incorrect and the actual figures are very much higher. How can that happen? Organisations and Individuals providing services for the elders should be registered under the Protection of the Rights of the Elders Act No 09 of 2000. It seems the regulation is not being adhered to. The writer believes the absence of a monitoring and regulation mechanism is the reason for this problem. The Government needs to step in to prevent unscrupulous groups of people take advantage of the loophole and prey on the innocent elders. To make matters worse, social service is a devolved subject under the 13th Amendment. That means implementation of the national policy becomes the responsibility of each Provincial Council. In most developed countries, senior citizen care services are categorized under Ministry of Health and Human Services. They believe the services involve the fulfillment of the special needs and requirements that are unique to senior citizens, either physical or psychological or both. The professionals in the health sector are fully qualified and experienced to handle situated related to those fields. Of course, the social workers have a major role to play under the guidance of health professionals. This is something the Government needs to take into consideration. Legal Minimum Standards for care providers should also be introduced. It is heartening to note that last year Sri Lanka Standards Institute issued a SLS certification 1506 prescribing the minimum requirements for elderly care homes for resident elders. This certification should be made mandatory for all elders’ homes after giving necessary training to the owners and staff of the institutions. A reasonable period should also be granted for them to adjust themselves. As we study the funding allocation, we note that there is a significant lack of government sponsored programmes or homes for the elderly. Only limited resources are set aside for elders’ homes. There are only four state-run institutions throughout the country. At the minimum, there should be two homes each district which should act as model homes with the relevant SLT certification. Given the demographic outlook in our country over the next 30 years, we need to start now a highly-defined programme containing the essential norms for the quality of care, health and welfare for our senior citizens. We cannot be happy with just the introduction of the SLS Certification and services planned for elders. All of them need implementation. There lies the problem and the central question remains. “Do we have the political will and the required funding and other resources to implement a multi-faceted programme so that we could achieve the excellence in elder care services?